Enrique Miguel Iglesias Preysler (Inglis /ɛnˈriːkeɪ ɪˈɡlɛsiəs/; Spaingie pronunciation: [enˈrike iˈɣlesjas], born 8 Mey 1975) is a Spaingie sangster-sangwriter, actor, an record producer based in Americae. 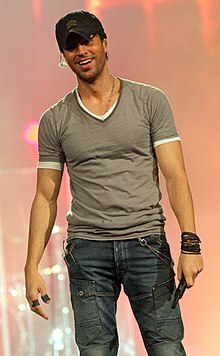 Iglesias stairtit his career in the mid-1990s on an American Spaingie leid record label Fonovisa which helpit turn him intae ane o the biggest starns in Laitin Americae an the Hispanic mercat in the Unitit States becomin the biggest seller o Spainyie-leid albums o that decade. Bi the turn o the millenium he made a successful crossower intae the mainstream mercat an signed a multi-album deal wi Universal Music Group for an unprecedentit US $48,000,000 wi Universal Music Latino tae release his Spanish albums an Interscope tae release Inglis albums. In 2010, he pairtit wi Interscope an signed wi anither Universal Music Group label, Universal Republic. Iglesias haes sauld ower 60 million units warldwide, makkin him ane o the best sellin Spainyie leid airtists o aw time. He haes haed five Billboard Hot 100 top five singles, includin twa nummer-anes, an haulds the record for producin 23 nummer-ane Spainyie-leid singles on the Billboard's Hot Latin Tracks. He haes haed 12 nummer-ane sangs on Billboard's Dance chairts an aw, mair than ony ither single male airtist. Aathegither, Iglesias haes amassed 70 nummer-ane rankins on the various Billboard chairts. Billboard has cried him The King of Latin Pop an The King of Dance. 2012 Glee "Hero" The song "Hero" was covered by Sam Evans and New Direction males as part of a mashup with Bamboléo. ↑ "Spanish singer Enrique Iglesias has sold more than 100 million records worldwide and is one of the most successful Latin music artists to cross over to the pop charts". Retrieved November 11, 2012. ↑ "Enrique Iglesias Extends Record For Most Latin Airplay No. 1s". Billboard. November 19, 2012. Retrieved November 19, 2012. ↑ "Enrique Iglesias brings Latino flavor to Puyallup Fair on Sept. 18". Auburn Reporter.com. June 18, 2012. ↑ "Vivir World Tour". Ondanet.com. March 31, 1997. Retrieved September 4, 2013. Wikimedia Commons haes media relatit tae Enrique Iglesias.